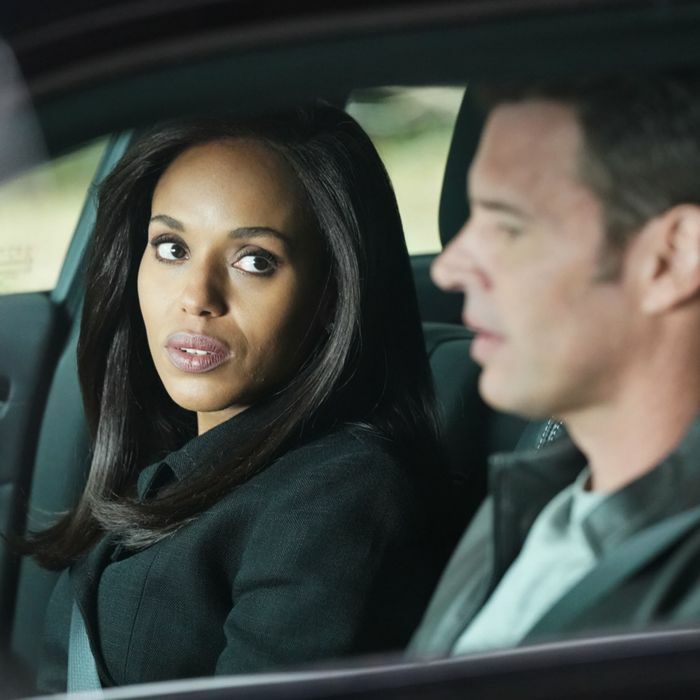 One of two possible conclusions can be drawn from the cliff-hanger of “Robin,” Scandal’s underwhelming winter premiere. The first possibility is that Rowan Pope finally grew tired of his paleontological hobby and decided a new baby would give his life purpose, so he arranged for a quickie adoption and is now just another single dad trying to have it all. The other, much more likely possibility is that Quinn Perkins is still alive and gave birth to the adorable Baby Robin under the watchful eye of Papa Pope, who has teamed up with her to bring Olivia to justice, or at least brighten up her sartorial palette. Assuming the latter explanation holds up, there’s not much reason for most of “Robin” to exist, given the bulk of the episode is spent mourning a character who was obviously never dead. Scandal is the last show on Earth that should be trying a bush-league misdirect like the offscreen death of an original character, so the only way to drive home Quinn’s death somewhat effectively is to commit to it fully. And so Scandal does commit to the totally ridiculous idea that Quinn is dead and gone by having the characters maneuver through the stages of grief. Honestly, it’s more than a little insulting to the loyal gladiators, who have stuck with this show through all its #WhatTheHuck peaks and B613 valleys. It’s one thing to convince the characters that Quinn is dead, but why go to so much effort to try to trick the audience? The bad-faith storytelling begins from the first frame, which finds Rowan in the kind of desolate wasteland that serves no other purpose than to house fresh corpses. He opens the trunk of his car and sets fire to a corpse in a bridal gown, which somehow causes the entire car to explode as an unfazed Rowan walks away. Does it make sense? Not especially, but it’s cinematic, so here we are. With a few waves of an expositional wand, the charred remains are identified as Quinn, and so begins a seemingly endless sequence of weepy mourning scenes that do nothing but stall the inevitable. Not since Game of Thrones have so many emotions been wasted on a character destined to return from the dead. First of all, it would be insane to kill off a beloved character in such a slipshod fashion. Let’s recall, this whole unpleasant affair began because Papa Pope couldn’t bear to be without his precious dinosaur bones, and I don’t think any television show in history has made bones that consequential to the story, including Bones. (Speaking of the all-important bones, Papa Pope actually gets them back despite apparently murdering his only leverage, so try making heads or tails of that.) But more important, Quinn has positioned herself as the only person able to effectively neutralize Olivia. Between their emotional bond and the serious leverage Quinn now carries, having discovered the truth about President Rashid’s assassination, no one is better poised to halt Olivia’s descent into darkness. If the final season of Scandal is about the war for Olivia Pope’s soul, that battle can’t be won without Quinn on the front lines. That said, “Robin” does make the interesting choice to have Huck also catch on to Olivia’s culpability in Quinn’s supposed death. Huck even goes so far as to share his suspicions with Abby, who tries to talk him down even as she probably knows deep down that his theory has a ring of truth. The most effective scene of the episode comes when Huck is burning the midnight oil at QPA (or whatever it’s called these days) and grabs his sidearm upon hearing what he thinks is a hostile intruder. Turns out it’s only a seriously soused Olivia, but he can’t bring himself to sheath his weapon knowing what the new Olivia is capable of. It’s a subtle scene that does more than anything else this season to demonstrate how far from grace Olivia has fallen. When Huck is afraid of you, you have some serious soul-searching to do. Aside from Huck’s revelation, not much comes from Quinn’s “death” other than a long-overdue hookup between Olivia and Fitz and the end of Cyrus’s burgeoning relationship with Fenton Glackland. In the former plot, I can think of more romantic circumstances than the purported murder of a pregnant woman, but Olitz is endgame whether we like it or not, so whatever works, I suppose. As for the latter relationship, it’s not entirely clear what purpose Fenton serves other than to give Cyrus something to do beside dream up ways to undermine Mellie. Then again, most of “Robin” is about figuring out ways to keep the plates spinning while Shonda Rhimes and her team set up the final moves for Olivia Pope and her motley crew of murderous civil servants. On the other hand, hopefully Katie Lowes enjoyed her maternity leave.